My recent solo trip to Oahu was planned with a few pit stops inked in on the itinerary. I googled “breweries on Oahu” and found much more than I expected. A nice range of establishments, from the world-famous Kona Brewing Company (now owned by the macro-giant Anheuser-Busch and brewed on the mainland as well) to the newest baby brewery Inu Island Ales, a two-man crew from Sacramento looking to put their own unique stamp on the island beerscape. I started and ended my journey in Waikiki, where most of the breweries are alive and booming. I “hopped” around town and managed to get plenty of island goodness in my beer belly, along with swag like t-shirts and stickers I collect for my refrigerator (see pic at the end of this gem). The form of transportation I recommend is walking. Burn that caloric explosion caused from barrel-aged stouts, pineapple wheat ales and double IPAs. However some breweries require a bit of a hike so taking TheBus or using the BIKI bicycle system is definitely a great option. If you’re staying at the Waikiki Beachcomber by Outrigger or any of the many hotels nearby, you’re in for a treat with the newly added Maui Brewing Company. This brewery is a chain but only on two islands, however they deliver their signatures all the way to the east coast. You may know them for their Bikini Blonde Lager, Big Swell IPA or their Coconut Hiwa Porter, but in the taproom they have over 30 crafts ready for your taste buds. Hot Blonde is their spicy take on the popular lager, with local Hawaiian chili peppers infused in their brewing method. Hhhhhhhhhot. Another favorite of mine, and is also available to us mainlanders, is the Double Overhead IPA. Citrus heavy with a malty bite. The eatery is large, holding ample space for live entertainment, bar games and a most fantastic gift shop. A must-go. Of course I couldn’t just loiter in the breweries the entire week (is that a challenge?). Just about every restaurant, from the ever-so-popular Duke’s at the Outrigger Waikiki Beach Hotel to a hidden gem like Pint + Jigger, you’ll find a local craft beer on tap or in bottle. It’s a beautiful thing when you can pair a local ale with the freshest fish tacos around. A few places even focus on having a large beer selection for the fans, such as Brew’d, Moku Kitchen and Yard House. There you’ll find an even larger selection, and not just the signature beers but seasonal as well. While in Waikiki, also visit Waikiki Brewing Company for their popular Black Strap Molasses Porter and their Eee Pah IPA. Attached to this little outdoor oasis is Cheeseburger Waikiki for some bites to soak up the suds. Travel a few minutes west of Waikiki and you’ll step into the new and improved Ala Moana and Kaka‘ako districts. New and popular eateries and mini-malls like the Ward Village is worth the trip. Visit soon before word spreads! Honolulu Beerworks has a fantastic industrial-chic taproom, farm-to-fork flatbreads and nearly 50 different t-shirts to choose from. Oh, and one of my favorite beers of the trip, the Cocoweizen. I wish I would’ve gone there earlier on my vacation so I could enjoy more of the light and refreshing Coconut Hefeweizen. A few other places I was not able to flock to was the Village Bottle Shop & Tasting Room, featuring over 500 bottles and cans of beer from all over the globe. Moku Kitchen is next door and I suggest their small bites or wood-fired pizza. Aloha Beer Co. and Home of the Brave Brewing Company look like fantastic spots to enjoy a flight as well. Waikiki Brewing Company has another location here. Kona Brewing Company has two locations and adding another soon. I’ll have to go there on my next travels. So the great thing about visiting the islands of Aloha is truly their ho‘okipa (Hawaiian hospitality). Proud people of the land consider you ‘ohana (family) and are happy to give you many recommendations on where to eat and drink and what else you can do. Every time I would step into a brewery and have a chat with fellow consumers and barkeeps, one suggested name kept popping up. “You have to go there.” That’s Beer Lab Hawaii, steps from the University of Hawaii (wouldn’t you establish yourself next to thirsty college kids?). Mad scientists is what I’d call their brewmasters. On the menu you will see your porters, New England IPAs and such, however you may come across hops you’ve never heard of before. They consider themselves experimenters of the small batch craft. “Live Pono, Drink Ono” is their motto (and a great t-shirt I now represent), meaning to live righteously and drink deliciously. Okay, let’s get the rental car and head out east! Before Siri takes you there, make sure you stop by numerous beaches and look-out points and enjoy the astounding Windward Coast. Next on the menu are three slices of heaven to visit. Grace in Growlers was featured in the latest Hawaii Magazine and is a new establishment, doing good for the community beyond just letting you serve yourself the dozen plus tapped favorites. “All profit is poured back in the community”, which helps the lives of the less fortunate. I’ll drink to that. So this new concept is all the rage around the states, where you are your own bartender. Of course there is a tenant there ready to give instruction and advice on what to try. When I was there, they had 15 beers flowing along with kombucha, mead and cold-brewed coffee. You get a micro-chipped bracelet and get to pick your style of glassware, swipe, pour, drink and repeat. You are charged by the ounce and the screen lets you know where you are at. You even have a limit which is a fantastic idea since most of us would be lousy drunk at some point of the night. Two blocks from GIG is Lanikai Brewing. Both located in the bustling town of Kailua give you fantastic options to BYOF (bring your own food). I recommend BBQ all the way with Kono’s North Shore. You can’t go wrong with an establishment that identifies themselves with a pig riding a surfboard. I recommend the Old School, a 12-hour slow-roasted Kalua pulled pork sandwich. Pair that with Lanikai’s Pillbox Porter and you’re a champ. Then, take home (or head to Lanikai Beach) a bottle of their award-winning sour series. Rubbah Slippah is their popular choice. Bright, acidic, tart and floral. I think the Island knows a thing or two about creating sours. They certainly have the botanic/fruit portfolio for it that the states could most likely never have. Continue onto the town Kane‘ohe, and you’ll run into Inu Island Ales (Inu means “drink” in Hawaiian). Like I said before, this is a brand new establishment and very small batched to say the least. Located in what looks like a pop-up garage on a busy street, you’ll get what you’ve been looking for despite the under-polished look. High-quality stuff. I met the young owner and he is excited about what’s to come for this word-of-mouth brewery. Shhhh….let’s keep this one a secret. Hop back into your ride and cruise some more along highway 83 and throughout the North Shore. Enjoy the sights, the sounds and the smells. Convenient stores, hotel and resort restaurants and even a Thai restaurant in the sleepy surfer town of Hale‘iwa is sure to have what you’re looking for…local goodness. Enjoy the Aloha way and drink responsibly! I am going to post a video of the Norwegian Bliss Staterooms. I was able to go in May on a two day inaugural cruise. I had a balcony which was beautiful. My favorite feature was the coffee pot. It should be in every stateroom. This is going to be a real quick blog post. I have been so busy the last few years I have had no time for my blog. Well I am back! I hope you enjoy my new posts to come. 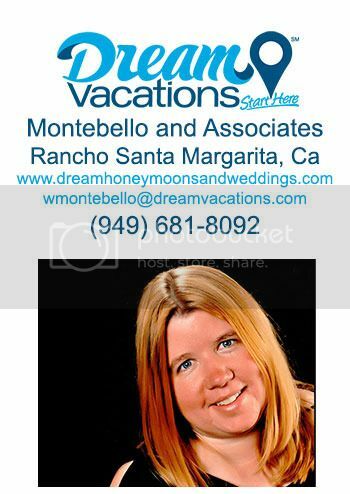 Wendy Montebello is a graduate of the College of Disney Knowledge and has attained a special knowledge of Disney Destinations.